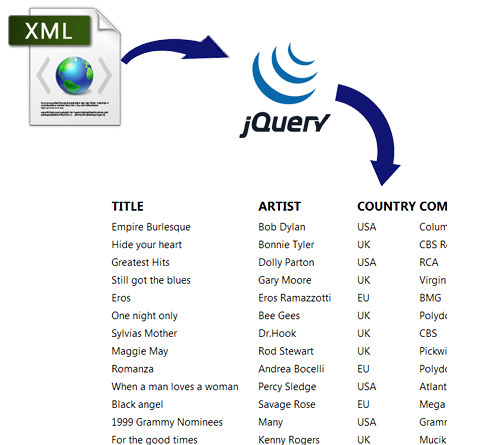 How to Fetch and Show Data from XML file using Jquery. In this post, I explain how to Fetch and Show Data from XML file using Jquery. In this tutorial, I am going to create an asp.net application where I will fetch the data present in XML format and display fetched content on the web page using Jquery. Step - 1: Create New Project. Go to File > New > Project > Select asp.net web forms application > Entry Application Name > Click OK.
Step-2: Add an XML file into Project. Right Click on Solution Explorer > Add > New existing item > Select XML File > Add. Step-3: Add a Webpage and Design for fetch and show data using Jquery. Go to Solution Explorer > Right Click on Project name form Solution Explorer > Add > New item > Select web form/ web form using master page under Web > Enter page name > Add. How to Fetch & Show Sql Server database data in ASP.NET Page Using Ajax (Jquery). Cascading DropDownList in GridView in ASP.NET with out Web Service, Ajax.